Carbon nanotorus. Click for 3D. At 1364 carbon atoms, it is a little too big to calculate any of its expected chiroptical properties (the torus twists in a helical manner, and so is chiral). So we can only speculate whether e.g. its optical rotation would also be colossal! Or, what applications such a nanodevice might have. 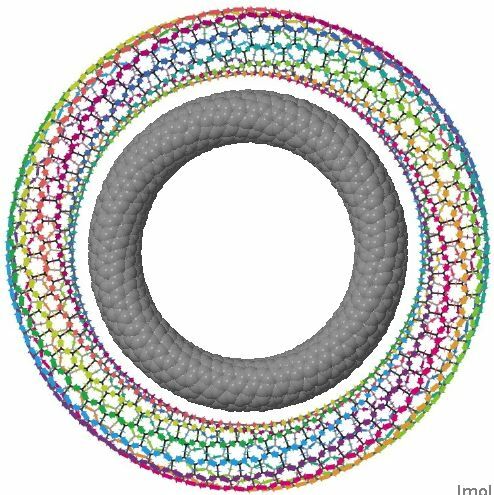 This post, by the way, was induced by seeing Steve Bachrach’s fascinating exploration of chiral nanohoops. This entry was posted on Thursday, June 2nd, 2011 at 10:18 am and is filed under General, Interesting chemistry. You can follow any responses to this entry through the RSS 2.0 feed. You can leave a response, or trackback from your own site. Perhaps some semi-empirics can give a glimpse at the chiroptical properties? ( ZINDO/S ) Maybe even PPP ? The original magnetic properties were probed using π-orbital tight-binding theory (which is related to PPP theory). Chiroptical properties tend to focus on time-dependent density functional implementations (DOI: 10.1371/journal.pone.0010617; it might be that no-one has explored chiroptical properties using tight binding, π-only theories. Tight-binding is the physicist’s extended hueckel theory, yes. We have a TD-PPP (full RPA) code in our group, it gives nice (qualitative) results (eg. for large organic systems DOI: 10.1039/b925334c ). I know the ORCA program can do CIS with ZINDO/S, but not PPP. Dont even know if there is any freely available program that can still do (TD-)PPP. I would give it a try, but I dont see how I can get a structure. If you follow the procedure outlined at this post, you will be able to acquire access to the coordinates of the nanotorus. These may need further optimisation, but in any case might suffice to explore a TD-PPP calculation for this species?